Quality Windowface envelopes for all your business correspondence. Choice of white envelopes with Self Seal and Strip Seal options in a range of the most popular sizes. Standard window size of 28 mm x 95 mm (position 32 mm from left, 16 mm from bottom) unless otherwise stated. 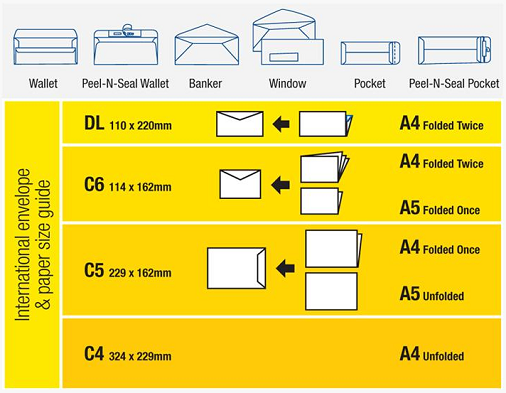 The most popular DL size envelopes take a sheet of A4 paper folded into thirds. Quality Window White Envelopes for all your business correspondence. Closure: Peel and Seal (or Strip Seal) - No licking or moisture required. Box of 500 wallet style envelopes. Post Office Preferred. Quality Tudor DL Window Presseal White Secretive Envelopes. Envelope Size: 110 x 220 mm (DL) White. Quality DL Window Envelopes in a convenient handy pack. Tray of 100 wallet style envelopes. Post Office Preferred.